Monthly meeting of “Baroiadala National Park Co-Management Committee” held at Owahedpur Union Parishad office, Mirsharai on 25 July. 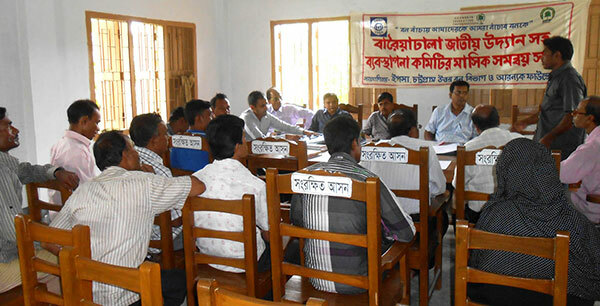 President of the committee Mr. Sharwar Uddin presided over the meeting while Assistant Forest Guard Md. Belaet Hossain, Md. Yusuf, Officer in charge of Mirsharia Pocice Station Imtiaz M.K. Bhuyan, Forest Range Officer Mr. Gazi Matiur Rahman, Ekramul Arefin, Chairman of Owahedpur Union Parishad Mr. Salauddin Salim, General Secretary of Mirsharai Press ClubSharfuddin Kashmir, Program Officer of YPSA Iftekhar Hosain were present in the meeting. Decision was made in the meeting to prepare a five-year plan for properly preservation of Baroiadala National Park and making the landmark as tourist spot.